Ever since I saw Ed Sharpe & The Magnetic Zeros at Coachella I've had a mini-crush on Jade Castrinos, my favorite of the "Magnetic Zeros" (although the trumpet guy puts up a mean fight sometimes for the spot). She was just so alive on stage, bouncing around with the biggest smile of the entire polo grounds on her face. Even more than the other Zeros, she just seemed to be ecstatic to be a part of something that had found such a devoted following. That was over sixth months ago, and the group seems to be buckling a little under their growing popularity (breakup rumors are floating around). With Alexander (aka Ed Sharpe) pursuing side projects left and right, one has to wonder, is the motley crew just a flash in the pan band? Are they an almost too good to be true medley of different artists and sounds that happened to come together to make music that has really struck a chord with people the world over? On their "itunes Sessions" album (released yesterday), The Zeros rework a couple of tracks from their debut while also dropping the studio version of their previously unreleased concert favorite, "Fire & Water." For the first time featuring Jade as the main vocalist, "Fire & Water" proves that the group isn't Alex (Ed Sharpe) +9, that the band is full of extremely talented artists who shine when it is their time. Jade's powerful voice is featured on this track and has a commanding sway on the listener. Her voice has a depth to it which is tough to describe. Laced with soul and gospel, and alternating between triumphant wailing and tender cooing, Jade proves she's got it. This could be a great thing for the Zeros, and might be a signal that their next album will that more rich because of the growth of artists like Jade. Or it could prove that the stage is too small to fit just one Edward and nine Zeros. Only time will tell, but in the meantime enjoy this great jam by my favorite band of the last year and a half. 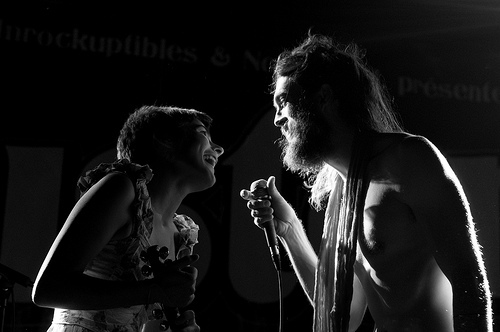 Edward Sharpe and the Magnetic Zero's - A Take Away Show from La Blogotheque on Vimeo.